Slow Cooker Smoked Gouda Grits Recipe - copycat "City Grits" from Another Broken Egg restaurant - stone ground grits slow cooked all day. Stir in smoked gouda and top with bacon, tomatoes and green onions. THE BEST grits! I could make a meal out of these yummy grits! When I went to Sandestin with my friends, we ate breakfast at Another Broken Egg. Everyone got the City Grits and loved them. Grits, smoked gouda, bacon, tomatoes and green onions - what's not to like?! I decided to make my own version at home. I had a bag of stone ground grits, so I decided to cook the grits in the slow cooker. I let the grits cook all day in the slow cooker and stirred in the cheese right before serving them. OMG! SO good!! We both took one bite and said "WOW!". You really should give these grits a try, even if you think you don't like grits. You can customize the grits to your family's taste. If you don't like smoked gouda, just use your favorite cheese in its place. 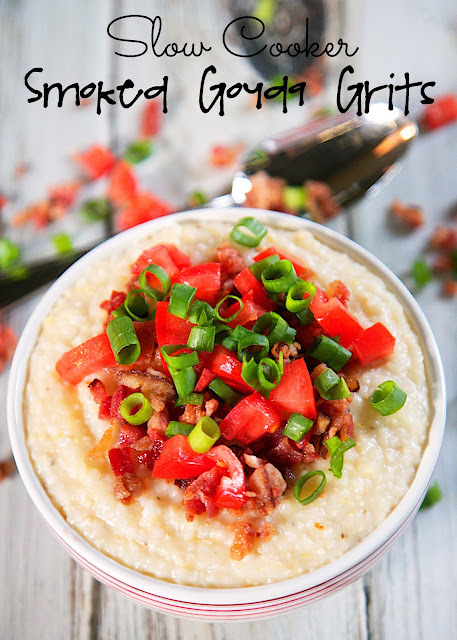 We both loved these grits, and I loved how easy they were to make! Fix it and forget it! My kind of side dish! In a 6-qt slow cooker, combine stone ground grits, chicken broth, onion powder and garlic powder. Cover and cook on LOW for 6-7 hours. Stir in smoked gouda. 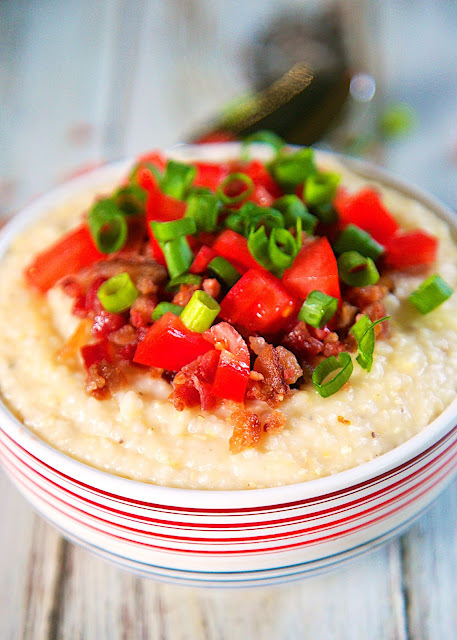 Top grits with bacon, green onions and tomato. I have never tried grits (I've been under a rock I guess), but I cannot ever pass up Gouda-it is my favorite! The fix and forget totally sold me on this side dish! These sound great and I didn't realize they could be cooked in a slow cooker without frequent stirring. What brand of grits do you use? The ones I bought don't say quick-cook, but I'm afraid they aren't the right kind. The cook time is 10-12 min. Had these while visiting South Carolina @ Another Broken Egg..... they were fantastic! Just made them, but substituted with instant grits,(short notice). I did not have smoked gouda on hand, but added a dash of hickory smoke liquid and used cheddar. Turned our great.